POOR MAN'S CAKE (a Norwegian Recipe).Twenty yolks of eggs, five whites of eggs, a pound and a quarter of sugar, one pint of sweet cream or rich milk, a sherry glass of cognac, one cup of melted butter, a little pounded cardamom seed, and enough flour to roll thin. Beat the eggs together until light, add the sugar and beat again, then the cream, cognac and butter. Melt the butter and pour off from the salt. Cinnamon may be used instead of cardamom seed. Roll the dough as thin as paper, cut with a jagging iron in oblong pieces, slit one end with the iron and pass the other end through it. Fry in boiling fat, drain on paper, and when perfectly cold put in a stone jar. These cakes will keep for months. Sounds to me a bit like those books for girls where the father lost their fortune and they became "a-one-servant-poor-family". Laura M. Child's book "The American Frugal Housewife" from 1832 has recipes that are more frugal. CUP CAKE.Cup cake is about as good as pound cake, and is cheaper. One cup of butter, two cups of sugar, three cups of flour, and four eggs, well beat together, and baked in pans or cups. Bake twenty minutes, and no more. TEA CAKE.There is a kind of tea cake still cheaper. Three cups of sugar, three eggs, one cup of butter, one cup of milk, a spoonful of dissolved pearlash, and four cups of flour, well beat up. If it is so stiff it will not stir easily, add a little more milk. Barley straw is the best for beds; dry corn husks, slit into shreds, are far better than straw. Buy your woollen yarn in quantities from some one in the country, whom you can trust. The thread-stores make profits upon it, of course. The first young leaves of the common currant-bush, gathered as soon as they put out, and dried on tin, can hardly be distinguished from green tea. Black or green tea, steeped in boiling milk, seasoned with nutmeg, and best of loaf sugar, is excellent for the dysentery. Cork burnt to charcoal, about as big as a hazel-nut, macerated, and put in a tea-spoonful of brandy, with a little loaf sugar and nutmeg, is very efficacious in cases of dysentery and cholera-morbus. If nutmeg be wanting, peppermint-water may be used. Flannel wet with brandy, powdered with Cayenne pepper, and laid upon the bowels, affords great relief in cases of extreme distress. Her Introductory Chapter is too long to copy here, but I can't refrain from quoting a few paragraphs from it. You can find the book here. 'Time is money.' For this reason, cheap as stockings are, it is good economy to knit them. Cotton and woollen yarn are both cheap; hose that are knit wear twice as long as woven ones; and they can be done at odd minutes of time, which would not be otherwise employed. Where there are children, or aged people, it is sufficient to recommend knitting, that it is an employment. In this point of view, patchwork is good economy. 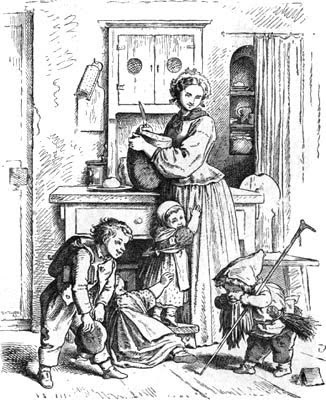 It is indeed a foolish waste of time to tear cloth into bits for the sake of arranging it anew in fantastic figures; but a large family may be kept out of idleness, and a few shillings saved, by thus using scraps of gowns, curtains, &c.
In the country, where grain is raised, it is a good plan to teach children to prepare and braid straw for their own bonnets, and their brothers' hats. Enjoyed reading about the recipes -first was interesting.